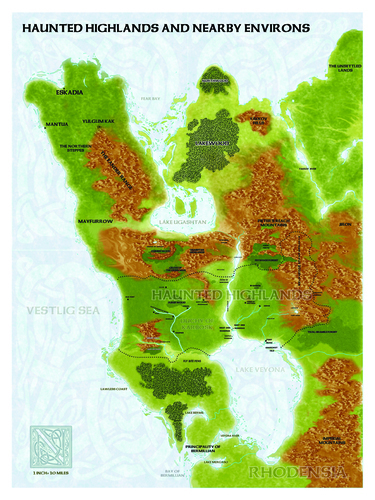 The Haunted Highlands World Map is designed for use with the Castle Keepers Guide to the Haunted Highlands and the Players Guide to the Haunted Highlands. Beatutifully rendered by Peter Bradley this 18" x 22" map is printed on poster stock paper. To the northeast of Dirty Bowbe's Roadhouse lie the ruins of Bortenski and the hazardous wastes known as the Witch Moor. Beyond that, the village of the Ugashtan and further still lay the broken crags of the Mythnoc Cairns where the proud barbarian people once buried their cherished dead. More, there are the trees of the Grove of the Green Man, the Crater of Umeshti, the Fey Wood and Troll Downs, the Free City of Eskadia, land ripe with the forgotten or lost treasures of a realm long passed. These are the Haunted Highlands.